These are those machines utilized for special purpose such as lifting & lowering the gates in hydro power plants etc. Being a leading name of the industry, we are recognized for our ability of manufacturing, supplying and exporting a ruggedly constructed range off 3 Drum Power Winch Machine for Mobile Tower Plant. Special Purpose 3 Drum Power Winch Machine Can be Drive by One Geared Motor. Special Purpose Machine can be drive 2 and 3 drum at one time. D.C. Dices type Brake fitted In Power winch Machine with manual Braking System. Being a leading name of the industry, we are recognized for our ability of manufacturing, supplying and exporting a ruggedly constructed range of Double Drum Power Winch Machine. Providing Electro hydraulic Thruster Brake with Manual Braking System for safety purpose. 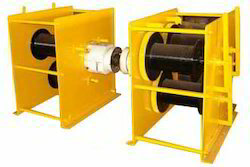 Variable speed can be provided in the power winch machine as per requirement. 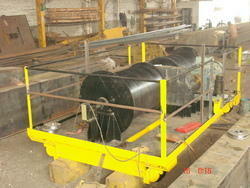 Special purpose 2 Drum Power Winch Machine 3mt for elecrto hydro power perfect.